We have created a suite of publications to provide you with more information on the services we offer and our delivery. 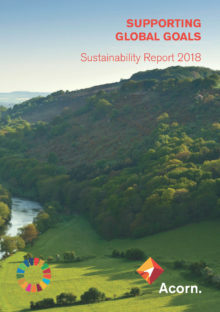 Our first-ever Sustainability Report published measures us against the United Nations sustainable development goals. 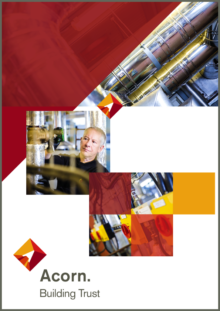 Our corporate brochure provides you with an overview of who we are, what we do and how we do it. 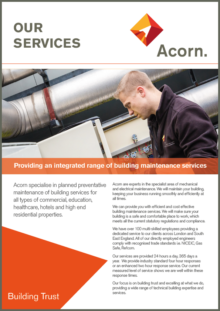 We can provide an integrated range of building maintenance services and specialise in planned preventative maintenance. 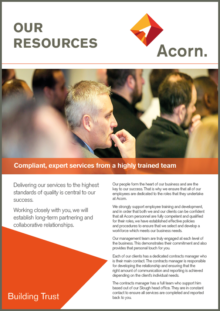 We provide our clients compliant, expert services from a highly trained team and believe our people form the heart of our business. 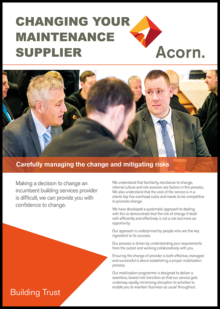 Making a decision to change an incumbent building services provider is difficult, we can provide you with confidence to change.